Librarian and other posts. 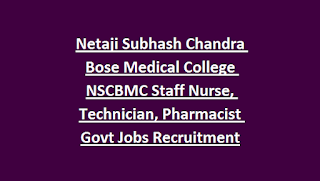 There are total 230 vacancies in NSCBMC Medical College Staff Nurse and other posts recruitment 2018. Last date to submission of application form to NSCBMC is 14-12-2018. Merit list will be displayed in www.nscbmc.ac.in in between 20-12-2018 to 31-12-2018. Application form also available for download in this website only. Detailed information about this NSCMBC Staff Nurse, Pharmacist and other post recruitment is given below. 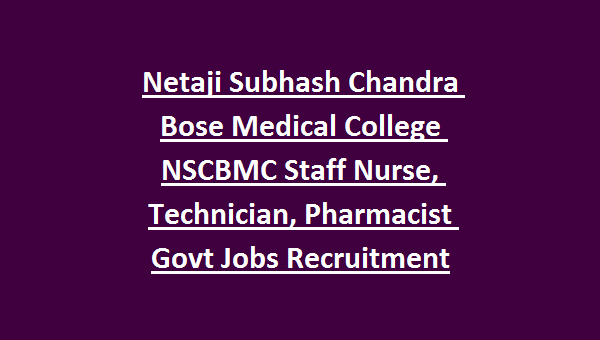 There are total 230 posts in this Netaji Subhash Chandra Bose Medical College recruitment 2018. Post wise vacancies are given below. Upper age limit for unreserved candidates is 40 years and for reserved candidates 45 years. For post wise qualifications refer official notification. Based on merit in qualification a merit/short list will be prepared. Those who are shortlisted they are only eligible for next round of recruitment process such as documents verification or interview. Application form submission last date is 14-12-2018. Download application form from the official website of www.nscmbc.ac.in. Merit list will be available in between 20-12-2018 and 31-12-2018. Sir i am now appearing in B.pharma ....final year can i apply for this?